Samsung has cut its third quarter profit forecast by $2.3 billion following the news of full recall of the Galaxy Note 7. After the continued difficulties and now recall of its Galaxy Note 7 smartphone, Samsung has cut its third quarter profits forecast by $2.3 billion after issuing much higher figures only last week. The company made the announcement that it would be cutting its profits forecast during a surprise regulatory filing after South Korea's financial markets had closed for the day. This week has been particularly bad for Samsung after it was forced to completely scrap the Note 7 as the replacement batteries it shipped to consumers were also prone to overheating and exploding. The financial burden caused by having to pull its latest flagship phone off the market was what apparently led the company to cut its potential third quarter sales figures from $7 billion to $4.66 billion. Samsung has also adjusted its earnings for the period from July to September as a result of the Note 7 debacle. Last Friday, the company released its profit estimates for the third quarter which forecast a six per cent increase in operating profits when compared to the same period in 2015. Samsung attributed this increase in profits to strong sales in its components division where its semiconductors have managed to sell surprisingly well. It was expected that the company's smartphone division would have an affect on its business, but the severity had been highly understated before its third quarter profit forecasts were altered. 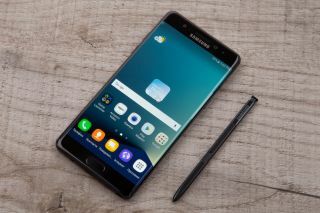 The Note 7 recall will certainly be costly for Samsung but it may even have to abandon the brand altogether as a result of the damage by the continuous barrage of news stories from consumers whose devices have blown up. Since news of the Note 7's battery defects broke, the company's market value has decreased by over $18 billion. In addition to lower profit estimates, Samsung was also forced to pay for and send out fire-resistant packages to US customers in order for them to safely return their recalled smartphones.